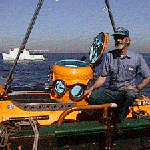 Doug Privitt has designed and built submersibles for more than 40 years. His Delta, Nekton and Submaray submersibles have logged over 12,000 dives off 5 continents and 30 countries. Doug began his career in Torrance, California in the 1950s. He worked as a tool and die maker and was also a winning motorcycle racer. Keith Stack, a fellow racer, introduced Doug to Ed Armstrong, who had built a one-man sub, Explorer. Doug helped Ed build a second sub called Aquasub in 1959, and several two-man Sportsman subs in the early 1960s. Meanwhile, Doug built his own two-man submersible, the Dolphin. At 14 feet long and 3,200 lbs, it could dive to a maximum depth of 350 feet. Dolphin was sold to Martin Toggweiler who changed its name to Submaray. In the mid 1960s, a group of geologists from southern California who had been using the Submaray, asked Doug to build a two-man submersible that could dive to 1,000 feet. 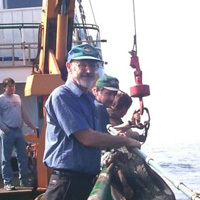 The group, General Oceanographics, helped finance the project. With the help of nephew Craig De Weese and Jim Vernon of General Oceanographics, Doug built the Nekton. In 1968, it was tested to 1,500 feet at the US Navy engineering facility in Port Hueneme. Nekton began diving off California, Hawaii, Alaska and Michigan including in the investigation of the Santa Barbara oil spill and in the rescue of the sub Deep Quest off San Diego. 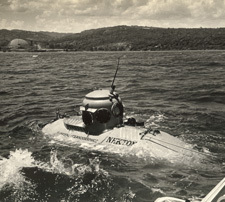 Following its success, Doug launched Nekton Beta and Nekton Gamma in 1970 and renamed his original Nekton, Nekton Alpha. 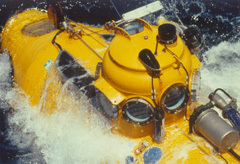 Doug designed and built the Delta submersible in the 1970s with the assistance of his son, Kenneth Privitt, a graduate of UCLA's School of Engineering. Doug also constructed most of Delta's supporting equipment including the underwater communications and tracking systems, the sonar, the mechanical and hydraulic arms, the submersible lights and the camera housings. Delta is 15 1/2 feet long, weighs 4,800 lbs, and can dive to a maximum depth of 1,200 feet. Delta has logged over 6,700 dives worldwide, with no dive days lost except to bad weather, and has a perfect safety record. At his Marfab shop in Torrance, Doug continues to maintain and make improvements to Delta, as well as working on designs for future submersibles. Adapted from: Slater, Richard A., Ph. 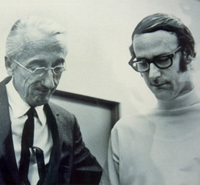 D. "Douglas N. Privitt: Submersible Pioneer"
in Historical Diver. Vol. 12, Issue 4, No. 4, 2003.